"Helps Prevent Hair Loss & Gray Hair"
Natures Elements DHT Blocker fuses Traditional Chinese Herbs like He Shou Wu and Saw Palmetto to stop hair loss and gray hair. 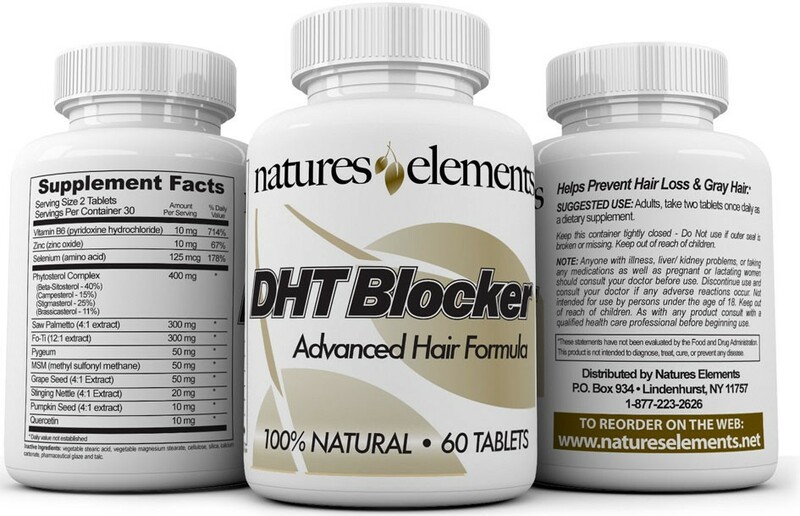 Natures Elements Dht Blocker is a 5 in 1 Comprehensive Hair Support Formula that addresses the 5 main hair and scalp related issues: Hair Growth, Hair Loss, Gray Hair, Scalp Circulation, Hair Follicle Nourishment and more. This one of kind formula uses high quality extracts that can be up to 12 times more powerful than ordinary powders! 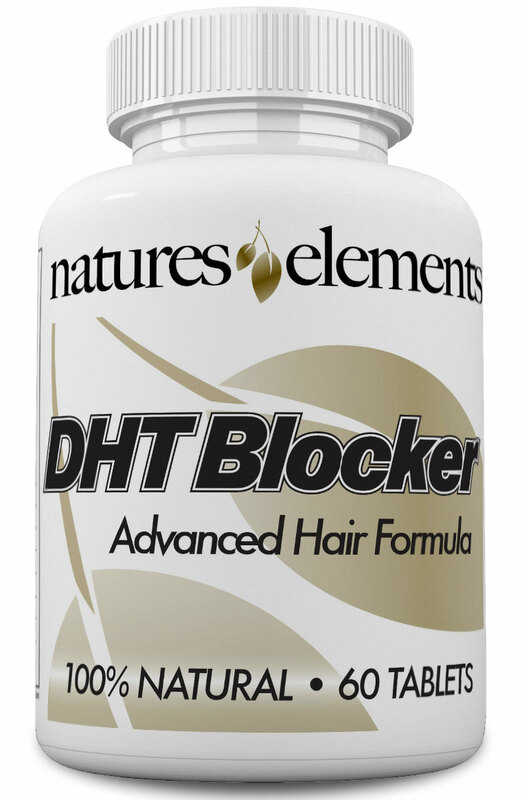 DHT Blocker for Men and Women has Saw Palmetto & Beta Sitosterol as well as other DHT Blockers that can help to suppress DHT (thought to be the main cause of hair loss) and promote hair growth from the inside out. In addition to DHT Blockers Natures Elements has also added a Chinese prepared herb He Shou Wu which has been known to reverse and/or prevent gray hair which sets this formula apart from others. 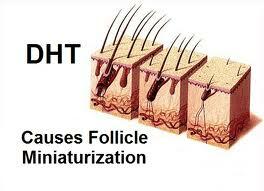 As we get older hair loss is caused by excess dihydrotestosterone, or DHT. Over time the body turns more and more testosterone into DHT, which causes the roots of your hair to miniaturize and stop growing. Extra DHT levels can also cause prostate problems in men like enlarged prostate and BHP problems which left untreated can lead to sexual dysfunction. Selenium boosts hair growth and reduces dandruff. Selenium can utilize foods that contain protein and boost growth of hair. This helps in proper functioning of hormones and increased growth of hair. Beta-sitosterol is a kind of phytosterol. It can be found in nuts, avocados, pumpkin seed, rice bran, wheat germ, corn, and soybeans. Taking saw palmetto and beta-sitosterol together can help signs of alopecia and also help maintain normal cholesterol levels. Rich in fatty acids and phytosterols, Saw Palmetto inhibits the production of DHT a form of testosterone that contributes to hair loss and prostate problems. Saw Palmetto may also enhance sexual functioning and desire. Pygeum is a tree found in Africa. Its extracts from pygeum bark include beta-sitosterol, other plant sterols. Some benefits include reducing inflammation and congestion. Effective in reducing prostate enlargement and aiding hormonal balance. Grape seed extract contains antioxidants, which help prevent cell damage caused by free radicals. Grape seeds contain an ingredient called proanthocyanidins. Proanthocyanidins have been shown to help with circulation. The nettle leaf is used in many hair products due to its ability to help stimulate hair follicles and regulate scalp oil buildup. It is also beneficial to the respiratory system. Pumpkin seed extract is rich in healthy fats, antioxidants and fibers that may provide benefits for heart and liver health. Pumpkin seed contain magnesium which is vitally important to physiological functions. 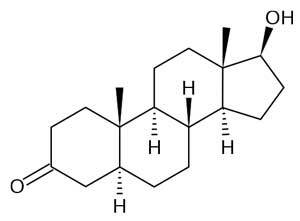 Also rich in phytosterols shown to help balance DHT levels. Quercetin has been shown to be one of the most bioactive flavonoids and has anti-inflammatory and antioxidant properties. Quercetin maintains healthy histimine production by supporting healthy enzyme activity. Quercetin is found in onions, apples and plants. How Long Should I Take DHT Blocker? DHT Blocker is taken daily with two small easy to swallow tablets. Each bottle of DHT Blocker contains a 1-month supply. Although DHT Blocker may work quicker from one individual to the next, we recommend you use it on a daily basis for the recommended period of time. After consistent use for at least 3-4 months, you should begin to see and feel results. You will achieve continued results the longer you are on the product. Be sure to order an ample supply. Natural medicine is designed to create a holistic balance within the body and can take time to propagate through your system. Be patient stick with it...you'll be glad you did! You can choose monthly or bi-monthly auto-ship by choosing Auto-Ship from the drop down menu below and choosing your shipment interval. In your first shipment you will receive a letter that states your next auto-ship date. After your receive 3 bottles you can do nothing and continue receiving regular shipments or you can cancel by calling us at 1-877-223-2626 or emailing at info@natureselements.net. There is no fee for canceling.